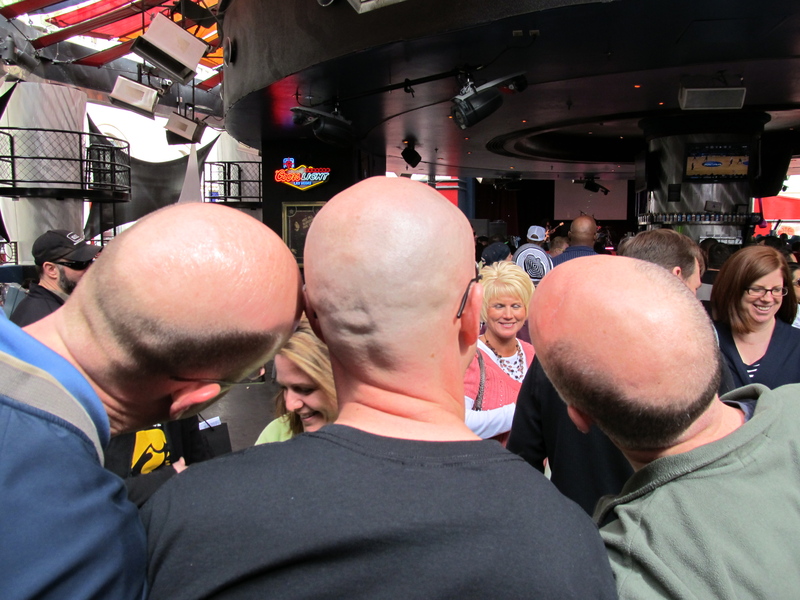 One year ago, on our spring break trip to Vegas, I snapped the first photo of my beloved baldies ( top photo left to right: Shane, Ryan, Dave). 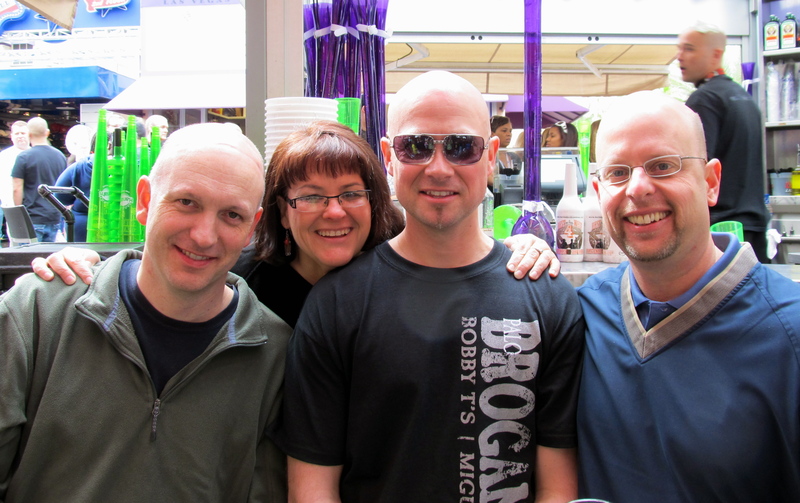 I then handed my camera to a friend, most likely Dave’s wife Wendy, to snap the second shot, with me in it (left to right: Dave, Me, Ryan, Shane). These bald heads are precious to me. I decided to repost these photos because today the brother-of-my-heart, Dave, is having major surgery on his noggin (that’s the official medical terminology). While I believe that all will be well, I can’t help but worry. So if you’re reading this, please say a quick prayer for Dave, Wendy and their three daughters (Abby, Katie, and Dani) – that the surgery and the recovery go well and as painlessly as possible. Thanks! One summer, between my 5th and 6th grade years, my parents bought me a bike: a bright yellow 10-speed with racing handlebars and thin tires that flew over the pavement. I rode that bike to the pool, to the soda bottler’s little convenience store, and as a getaway bike when my friends and I decided to run off with Suzie-Q’s without paying for them. The faster I went, the better. I had little to no fear. Until the day a kid who was making a career out of annoying me ran out into the street just as I was picking up speed going downhill. He pushed me from the side, and I went down. Hard. Some older boys in the neighborhood saw it happen. I never found out what they did to that poor kid, but one of the older boys came by my house later to assure me the pest wouldn’t be bothering me again. Even though I wasn’t seriously hurt, that incident took some of the joy out of my riding. I was suddenly, viscerally, aware of how easy it was to get hurt at fast speeds. The spill, coupled with the fact that it was a time when teenaged girls were encouraged to give up such active pursuits, caused my bike riding days to dwindle to a close. The yellow ten speed was around for years after I stopped riding it – I’m not sure when my parents finally got rid of it. A couple of years ago, my friend Sue and I decided we were in need of a real vacation, and picked a resort in Michigan right on the lake hoping for long hours on the beach. But the gnats and biting flies were so bad we could only take short bursts of time on the lounge chairs. The resort had bicycles available for check out, and even though it had been 25 or more years since either of us rode, we decided to take a couple bikes for a spin. We were wobbly and easily winded, but both had so much fun we returned to our respective homes and bought bikes. The rest, as they say, is history. Last summer I upgraded to a better bike, a Trek hybrid, and trained for something I’d always wanted to do: ride a portion of RAGBRAI. I spent every spare moment all summer riding. I travelled hardly at all, in favor of getting more time “in the saddle”. You can read my two-part post about my RAGBRAI experience, if interested, here and here. It was amazing. But after RAGBRAI, I found myself making excuses not to ride so much. Fall came and went, with barely an additional 75 miles on my bike’s odometer. In December, we had such mild weather that I was able to ride twice the week between Christmas and New Year’s. Now, our early spring has provided a couple of weeks of sunshine and warm weather perfect for cycling. At first, I had to negotiate with myself to get out by promising myself a reward. I wondered if I had not really enjoyed biking as much as I told myself – I mean, this reluctance to get the bike out must mean something. Perhaps I had just liked the idea of liking an activity that well, or I enjoyed talking as if I was an enthusiast. Or maybe I just liked the challenge of RAGBRAI, and once that was checked off my bucket list I stopped needing to ride. I love the fluidity of cycling, the grace you begin to display as you grow more attuned with being on the bike. On a bike, I am fiercely competetive – but only with myself. The other cyclists can do what they can do. Some are stronger and faster than me, others aren’t. But with the aid of attention to my body and my on-board “computer”, I can gauge how I am doing from one ride to the next. I can up my effort to see different results, I can privately crow with delight when my MPHs are up by an average of two miles. I can see my technical competence improving (I now know a lot more about using my gears than I ever thought I would, for example). On a bike, I am an athlete. Bicycling has helped restore my love of the outdoors. The other day a snake crossed the path right in front of me. Trees that were budding on that ride were in bloom on my next ride a week later. 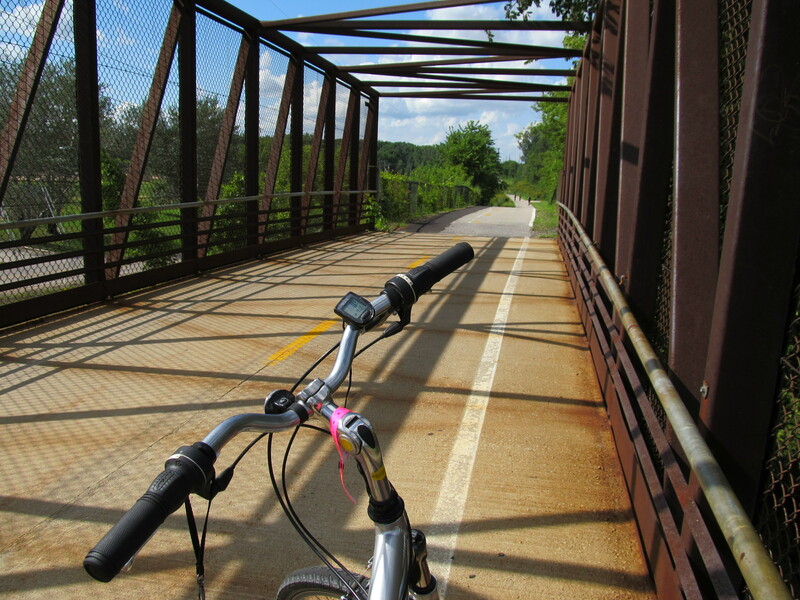 The nature trail I primarily ride takes me along the river, and through woods. Yesterday, I felt something alive inside my helmet and reached up to brush it off me. That’s when I discovered it was a bee…even being stung didn’t dim my enjoyment of riding an easy 18 mph with a strong wind at my back. I never expected to find a physical activity which is at once both challenging and deeply spiritual. I know many people feel this about running, or about yoga. In my adult life, exercise and physicality has usually been work, occasionally accompanied by a feeling of accomplishment. Never joy, until now. This morning at the gym, just as class was beginning, one of the women said, “Jen, you’ve convinced me: I’m buying a bike!” I was touched, because I haven’t spent a lot of time trying to convince anyone to do anything – but I have spoken about what cycling has brought into my life. When we discover passion in our own lives, it has a way of igniting excitement, and sometimes igniting a kindred passion in someone else. My hope, today, is that each of you has the opportunity to feel and share a similar passion in your life, especially you fellow late-bloomers out there. Because a life on fire with delight is a wonderful thing at any age. Even though we can’t name them by name, can’t even generally define who they are, we all tend to have an amorphous “They” who exert extreme influence over us. They will think I’m stupid. They will judge me. They will be sure to spout all kinds of ridiculous opinions which cause me to question myself. Don’t even get me started on the “always-es” and the “nevers-es”. They are full of those polarizing words, too. They don’t know how to stop talking. Never mind how often it is in the voices of real people versus how often it is voices in our heads. They always have something to say to put us in our place. Time is such an interesting construct. If you stand still, it will act like a stream which flows around you, the water moving, things floating past, but you stay in essentially the same place. Other things change, but you do not. If you think of Time as a stream, and you try to move with the current, you may find you have moved but you are still surrounded by the things that you started with, because they moved with the same current. Nothing is essentially different, except that years have passed. Time can also be a riptide, pulling you along in whatever direction it is moving. You have to be aware, not panicked – deliberate in your movements – in order to move where you hope to go, rather than where time is taking you. What time changes is mostly external to you. Internal change is like learning to swim out of a riptide. …you actually have to change them yourself. This is the daunting truth. The truth that stops us from actually creating change in our lives – we have to do it ourselves. And we know it will take hard work, sacrifice, and a willingness to stay the course when we are mostly used to taking an easier path. The joy that I’ve discovered, though, is this: the internal voices, the imagined “they”, may clamor loudly at first, belittling your desire to change. But the external voices, the real people around you? They will come forward with a generosity of spirit that takes your breath away. They appear from unexpected quarters to cheer you on, to support your effort, to be part of the positive difference in your life. I know this both from personal experience, and from the many others who have shared with me their own experiences of bringing big change to their lives. They, your giving supporters, may not be the people you anticipated would be there for you. They may, in fact, be people you thought of as incidental to your life. Nonetheless, a new crowd of voices will develop to uplift you and to combat the negative voices you listened to in the past. The second, almost magical, truth about deep change (especially if you are a late bloomer, like me) is what it does for your concept of time. You begin to learn that time doesn’t have to be a stream or a riptide. It can be a deep pool, in which you float in a relaxed but aware state. There is no past, there is no future, there is this moment. Every moment, as you live it. If you are wondering whether you can change, whether there is a way to create a life more in line with the one you dream of living, the answer is simply YES. And yes, you actually have to do it yourself. But the first step, the beginning, is the hardest part. And many things will come together to assist you once you set your step to that path in a committed way. I posted these photos, and others, last year. But I wanted to post them again in celebration. 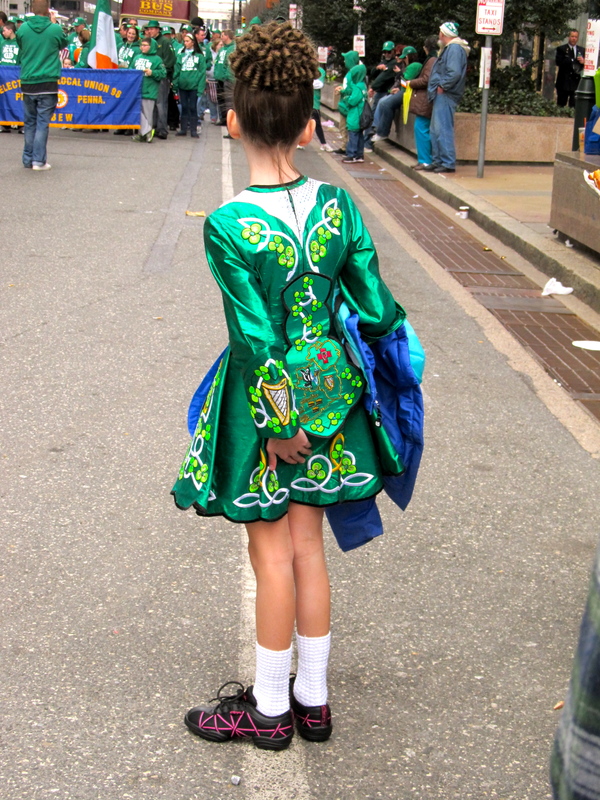 But not really in celebration of St. Patrick’s Day – rather, I’m celebrating the one year anniversary of my trip to Philadelphia. The first time I’ve ever visited a major city by myself AND truly enjoyed it. 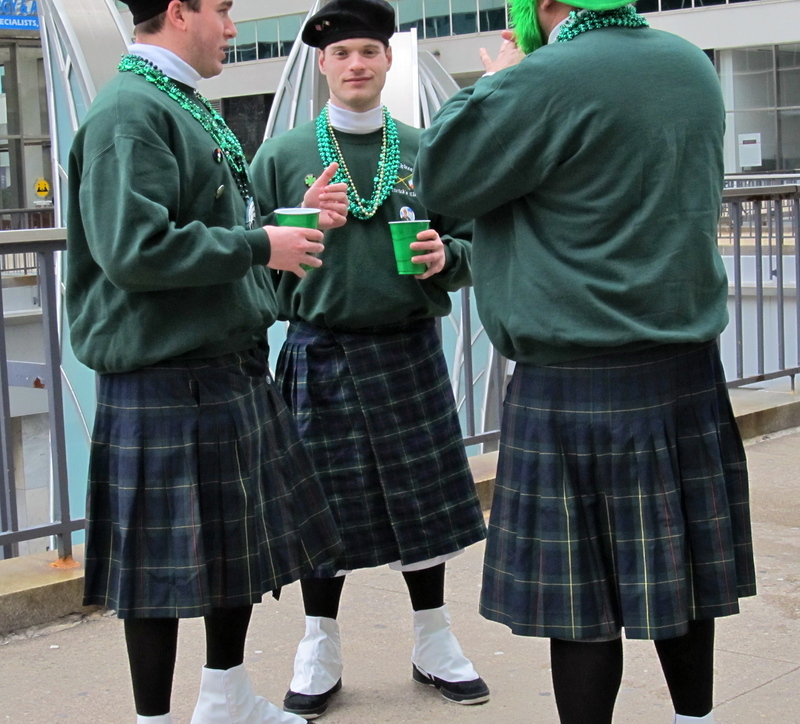 I did all sorts of interesting things, perhaps none more “in the moment” than following a group of boisterous twenty-somethings who were all decked out for St. Patrick’s Day on a Sunday morning. I didn’t know where they were going, but I was curious and had my camera. 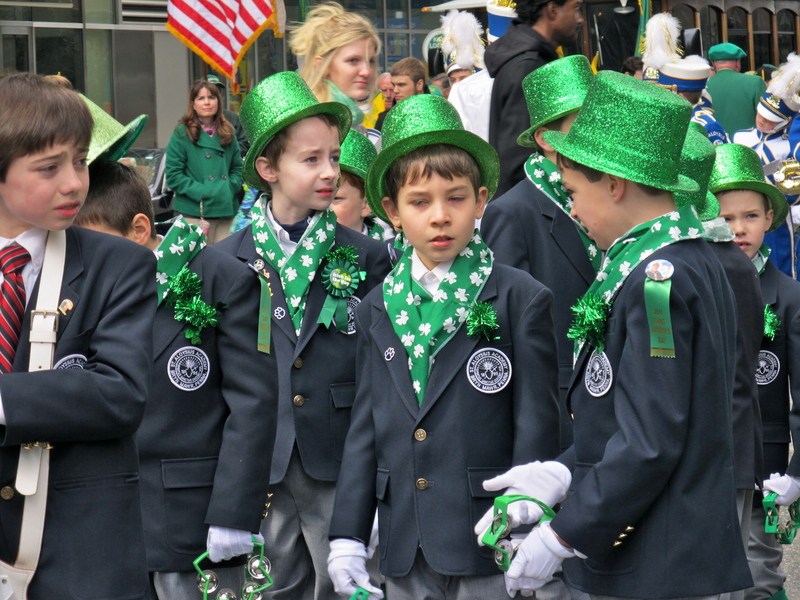 The next two hours were spent happily observing and photographing the parade as groups lined up, dignitaries glad-handed (yes, I was mere feet from both a governor and a cardinal, whom I recognized from scandal-related stories and photos in the Sunday paper that morning)… and cute guys in kilts did…whatever! I hesitate to mention it here, but I haven’t felt really well for several weeks now. It’s nothing serious, just one of those things that leaves you feeling tired and weak. And after a while, tired and weak leads to depressed – not clinically, but definitely down. I hesitate to mention it because there are people reading this post who are dealing with lasting, serious or chronic health conditions and I feel like a heel for complaining. The reason I decided to bring up my respiratory infection is not, however, to have a wider audience for my complaints. I started crying for no good reason during a meeting today. I have spent the past two evenings at home feeling cotton-headed, and emotionally isolated. 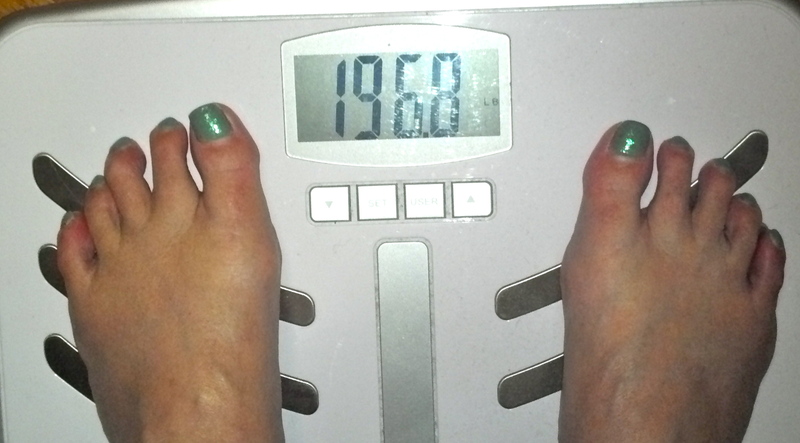 And all of this is the result of a not particularly debilitating condition. What if I felt this way all the time? How would I cope with that? These questions have led me to think about my role in working with young people – especially those who struggle with depression, anxiety, suicidal ideation. Some of you have heard me say that today’s students appear to have fewer coping skills and less resilience than the students I worked with when I entered my career twenty plus years ago. For some, this leads to an inability to take “normal” bumps in the road of life in stride (breakups, failed tests, etc.). For some, the life events they are attempting to take in are shockingly horrific. And this includes mental illness and personality disorders. A sobering truth: although college students commit suicide at a slightly lower rate than their age-mates who are not in school, suicide remains one of the leading causes of death among college students. This is a truth of which I am currently hyper-aware. What can I do? My job is to do my utmost to keep them safe, to provide a safety net of concern, awareness and response when a student in crisis is brought to my attention. But what else am I to do as an adult who has successfully maneuvered through late adolescence and early adulthood? What are we all called to do to assist others who are struggling? I try to stay away from making sweeping generalizations about our culture and how the “Jersey Shore” mentality is harming us all. But I do think the paucity of character and values in popular culture is detrimental to young people. And the influence of popular culture is multiplied by a vaccuum in their daily lives created by the disappearance of adults who are prepared to help them find meaning and purpose in life. Because we’re not talking with them about meaning and purpose. We’re talking with them about how to maximize their earning potential. We’re talking to them about filling their resume with activities that will help them stand out in a sluggish job market. They’re listening to their parents trying to figure out how to get above water financially, and they’re turning to vacuous tanned talking heads to escape their anxiety. I’m not suggesting that we stop attempting to help our young people prepare for careers. I am suggesting, however, that we need to do a better job of recognizing the need for young people to feel that their activities, their work – their very lives – have meaning. That their lives have a purpose beyond that of basic survival and/or material comfort. And as sometimes happens when I am ruminating on such ideas, a perfect resource appears which can explain my jumbled thoughts better than I can. Yesterday, I saw the short film clip, below, over at The Better Man Project (a personal motivation blog I follow). I strongly encourage you to watch it – four minutes with the great Viktor Frankl, whose book Man’s Search for Meaning remains one of the most influential in my life. As always, Frankl speaks with eloquence and humor, and what he says is as true for today’s students as it was for the young people listening to his lecture in 1972. If we fail to recognize the “will to meaning” within an individual, we fail that individual. And the cost of that failure is very high – lives are, literally, at stake.